I gave this book 5 stars. It was exciting and creative. I was just blown away by how creative the whole book was. I loved all the characters and I was routing for them. I almost forgot to write this review, I actually just remembered that I hadn't already written it, so here I am. I will forever be fascinated by Kell's coat. It can turn inside out and become an entirely different coat. Not just one different coat, but several, maybe an infinite number of them and some are just harder to find then others. I can't wait to get to the next book and find out more about his coat. Lila was a strong minded character, she wasn't the most badass, but then I don't think she really wanted or needed to be. She was just sort of at a happy medium that I really appreciated. Not all main characters have to be able to kill someone with their bare hands. She at least had to use a knife. I was also really fascinated by all the worlds. We got some depth to three of the worlds, White London, Grey London, and Red London, but we never got to see much of Black London. There isn't much said about it other than it's basically deserted and no one goes near it. I hope that in the next book that is also touched upon. I don't know if this is what the author was going for, but I really liked Holland and Athos. I know they're the villains, but there was something about them that I can't put my finger on. Even though they were supposedly on the same side, they still hated each other and each wanted power. Now Astid I didn't really care for. She was just really creepy when it came to Kill and I just wanted to protect him from her. Now I know that Holland attacked Lila and that may or may not be worse than what happened with Astrid and Kill, but it wasn't actually Holland's choice, it was Athos and Astrid forcing him to do it. That's how I justify these things in my head. What really creeped me out was that whole invasion of the body snatchers thing that was going on. The magic was taking form and stealing peoples bodies and spreading around. I was incredibly uncomfortable during these times. I'm glad that in the end it was dispelled. Overall, this book was fantastic and I would recommend it to everyone. The plot was strong, the characters were strong, and the creativity was off the charts. 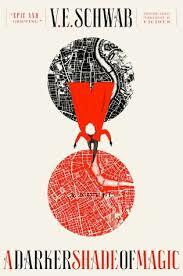 This was the first V. E, Schwab book I've ever read and I was not disappointed. I'm excited to see what other adventures the author can bring me on.